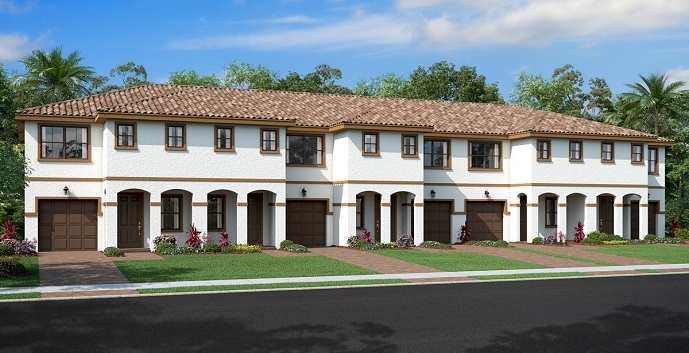 Quality builder Lennar is featuring a new townhome community in Lake Worth called The Groves. The community will consist of 63 spacious townhomes ranging in size from 1,719 square feet to 1,726 square feet. The 2-story townhomes at The Groves will be offered in three different styles with either 2 or 3 bedrooms with 2.5 bathrooms and attached garages. The Groves community amenities will include a pool, cabana and playground. Prices range in the mid $200,000 making it affordable for young families and first time home buyers. The Groves offers 3 townhome designs to chose from. Vineyard - 2 story townhomes with 3 bedrooms, 2 and 1/2 bathrooms, family room, dining room, living room and 1 car garage. 1,726 square feet. Priced from $257,990. Orchard - 2 story townhomes with 2 bedrooms, 2 and 1/2 bathrooms, family room, dining room, living room and 1 car garage. 1,726 square feet. Priced from $261,990. Glen - 2 story townhomes with 3 bedrooms, 2 and 1/2 bathrooms, family room, dining room, living room, and 1 car garage. 1,719 square feet. Priced from $267,990.